This is a re-run of the vastly popular .311" 130 grain boolit perfect for the 300 Blackout. It's been run a couple of previous times, and every time it was a sellout. So, we are doing it again. The 300 Blackout continues to be a popular chambering. It's also an awesome boolit for the M1 Carbine. 5) Can be added to any version of this buy, DHL shipping is an additional $8 (US) Please specify if you desire this shipping method. Otherwise shipments not designated as DHL will ship regular postal service. 6) I need your zip code so that we can provide tracking and shipping confirmation for regular post service shipping. No Charge, need zip code in all listings, please. These prices are the 15% discounted price. Add a set of high quality handles to any mold order for only 20 Euros extra, the handles will ship with the molds. NOTE: Each of these molds can be produced for you in any dropped bullet diameter, including .311", .314". That will allow you to size and load these in a variety of cartridges and rifles. AR/AK, whatever. They are well suited for a number of uses. NO MIXING OF Bullet types or diameters in any mold. We require 25 molds, total, to proceed with this buy. All prices are quoted in Euros. Miha will issue PayPal invoices in Euros, which when paid, will be paid at the current exchange rate in US Dollars. You do NOT have to use PayPal to pay the invoice. The invoicing system will allow you to use any credit/debit card for paying the invoice. Please provide your preference for number of cavities, plain base or gas checked, and size of bullet, zip code, and whether you want the handles and the DHL shipping method. If you are building a 300 Blackout, or any gun which would benefit from this boolit, get on the list ASAP. I would expect that this one will go quickly. If any questions, please PM me here. We'll need the obligatory 25 HP orders as is Miha's need for re-buys on hollow points. It has to do with the minimum purchase he has to make for the pin sets. We are already at 28 Hollow Point orders, plus the three solid nose. When we get to 25 HP's, Miha will close the buy, so this one will likely go quickly! NOW AVAILABLE WITH ALL MOLD ORDERS - HANDLES! Handles (which fit all MP-Molds), ordered separately, are normally $23 Euros, which includes shipping. If you order any handles with the molds, Miha will reduce the price to $20 Euros, and will ship the handles with the molds. So, this is a great opportunity to get a set of Miha's wonderful handles at a great price. Please advise if you want handles shipped with your mold(s). Please provide your disguised email address, as Miha will use that when the molds are ready, for invoicing purposes. Include number of cavities, and whether gas checked or plain based, and with or without handles. All prices include shipping. If you order the mold with handles, the handles will invoice at a discounted price (additional 20 Euros), and will ship in the box with the mold. To assist with providing you tracking and shipment confirmation details, I will also need your ZIP CODE. And, finally, we will offer, for an additional fee of $8 (US) the option to ship your mold(s) via DHL Rapid Delivery. That's three days, door to door. It's an extra fee, but will get your mold(s) to you very fast, even during the upcoming holidays when everything else historically slows to a snails pace. So, if you are in on any of the MP-Molds group buys, please provide your honcho with your zip code, and whether you want the DHL shipping. We have achieved enough mold orders that Miha has declared that this group buy is closed. He's ready to run production!! I am moving this buy to the CLOSED area. Miha will likely make a few extras, but not many. If you have been on the fence about this buy, get off the fence and join in. Last Call! Last edited by DukeInFlorida; 09-25-2018 at 09:36 PM. Price for a 4 cavity solid .311 gas checked? Interested...are the only solid options listed? would it work in a 30/30 ? Yes, two and four cavity only, you choose gas checked or flat based, and the diameter of the dropped boolit. And is a diameter of .309 as cast possible? If .311 is the smallest, it will be horrific to size down to .309, or? I have the same MP 311410 4cav HP and I size it to 0.3095” with no problems. I then powdercoat it to get 0.311” which works best in my 300 BLK. Great boolit, very useful with short and long HP pins! Last edited by evoevil; 05-10-2018 at 07:55 AM. Ok, so please put me down for one 2 cavity Hollow Point .311 gas checked + one set of handles. Last edited by schemelschelm; 04-19-2018 at 10:47 AM. I'll presume that you are somewhat new to casting. It's quite common to buy a .311 mold when you want to end up at .309. Easy to do with one pass. Last edited by DukeInFlorida; 04-19-2018 at 02:54 PM. Easy to do with one pass. Just to be clear, is this GB also subject to 15% discount off the listed price? 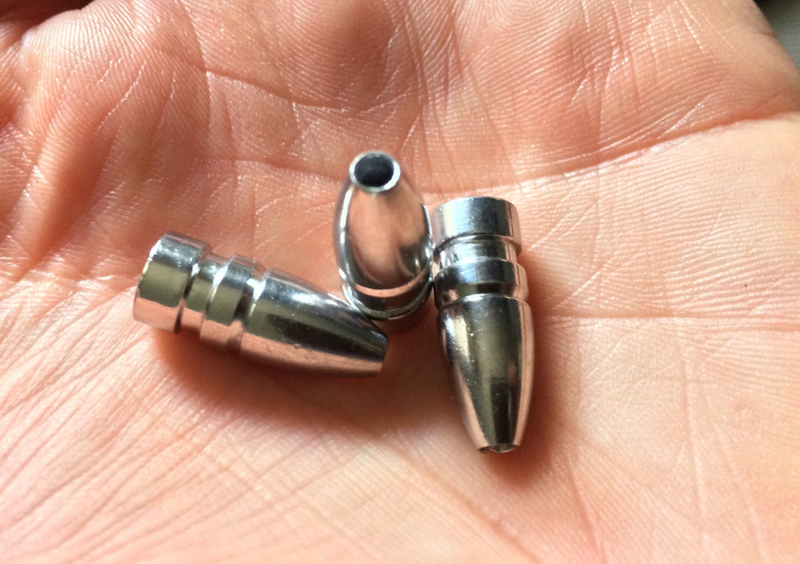 (1) two cavity hollow point with all pins, gas checked .311 no handles.